Story Line: Ben Affleck delivers an intense performance as an accountant with a secret in this curious thriller from Warrior director Gavin O'Connor. Ben Affleck shines in this curious thriller from Warrior director Gavin O’Connor. Despite the potentially uninviting name, The Accountant proves to be a multi-layered feature that offers plenty of food for thought and an intriguing blend of themes and influences. Part character drama, part action-thriller and part conspiracy theory; O’Connor attempts to sew these various threads together to deliver something quite different and unusual. The key theme revolves around Affleck’s titular Accountant, Christian Wolff, and addresses the subject of highly developed autism and its affect on a person’s ability to function and connect to the world. This is developed in the over-arching story line of Affleck’s investigation into missing money from John Lithgow’s large robotics corporation and the adverse repercussions of his findings, as well as the recurrence of Jon Bernthal’s hit-man for hire. Needless to say, these multiple strands all become connected and are founded on Affleck’s character of whom we learn more and more about through a series of flashbacks to his childhood. We meet him first of all in his office, talking to a couple of clients. Clearly struggling with social connectivity and embodying an awkwardness which Affleck superbly delivers, he resembles the very stereotype of his profession. However, the always brilliant J.K. Simmons’ Treasury Director wants to investigate this initially unknown accountant, as he has been pictured on numerous occasions meeting with members of various organised crime groups and drug cartels. Simmons brings in a Treasury analyst, Cynthia Addai-Robinson (who was fantastic) to lead the investigation. Meanwhile, Affleck’s Wolff takes a job at Lithgow’s company to investigate the apparent missing funds, which were discovered by Anna Kendrick’s Dana (endlessly endearing in her ability to portray nervous, girl-next-door type characters) who riffs off Affleck’s awkwardness brilliantly. There is therefore a lot of content here involving Affleck’s Accountant, all of which is underpinned by the subject matter of autism. With so much screen time, Affleck was always at risk of overplaying the condition. However, despite his critics, Affleck really is a fantastic actor and in recent years has demonstrated time and time again a natural ability to portray restrained, understated characters. This was key to the role, with his controlled delivery supported in the flashbacks in which we see Wolff as a young boy experiencing episodes, triggered by different incidences (credit must go to the young Seth Lee for an excellent performance of a difficult role). These flashbacks provide the understanding and background to who Wolff has become, with his military officer father coaching Wolff to channel and utilise his condition. We see how the adult Wolff has learned from this as we are introduced to his routines and habits, and how he still verges on the brink of an episode when his thought process or routine becomes disrupted. One scene in particular stands out, when Wolff’s unusual meditation process severely spirals out of control and his frustrations from an earlier incident come to the fore. Accompanied by an intrusive flashing light and loud rock music, it makes for uncomfortable viewing as O’Connor attempts to create an overload to the senses in order to reflect what Wolff is experiencing himself. Interestingly, Wolff’s character does draw out comparisons with Bruce Wayne / Batman (played by Affleck, of course, in the recent Batman Vs Superman). 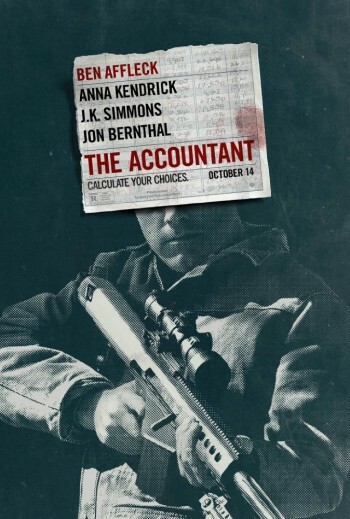 The ideas of secret identities, combat skills and struggles to form new relationships all relate to both, although with The Accountant, this is open to potential criticism that O’Connor is using autism as some form of super power once we discover just what Wolff is really capable of. Whilst this may be a warranted observation, a more valid comparison may actually be with the TV show Dexter; Michael C Hall’s serial killer had learned to hone his needs and desires, control his urges and adapt to social situations having been coached and mentored by his father. Indeed, it is the relationships between these characters and their respective fathers that really connect them. For each of these characters, their fathers play a definitive role, moulding them into adulthood, remaining prominent within each of their thought processes and motives. In each case, these paternal relationships are the strongest these characters have ever known and therefore they also share further similarities in their difficulties in building new relationships, be they with love interests or general acquaintances. They are all lonely, all burdened, and all self-sacrificing, yet all long for a connection. Once again, Affleck portrays this sensitively and with real warmth, as he tells Kendrick of his yearning to be able to connect. All he ever knew was his father and his brother, who feature heavily in the flashbacks, yet it becomes clear that Wolff no longer maintains these relationships for reasons that are explained in the film. This in itself draws comparisons with O’Connor’s earlier film, Warrior, and its insightful narrative about the fall out between two brothers and their father. This particular scene mentioned above represents much of the film in terms of its tempo. Heavy in dialogue and with a slow, unfurling pace, it embodies the understatement of Affleck’s performance. That said, when the action begins, it comes with a real intensity that bulldozes any sense of calm restraint out of the audience’s mind. The aforementioned scene with the lights and music, alongside the fight scenes and the deafening thunder of assault rifles, all shatter any preceding drama. 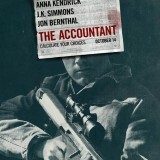 In fact, the very opening scene of The Accountant overtly hints that violence will be prominent throughout this film, so whilst the action is expected, it often feels quite misplaced. This feeling of misplacement is perhaps epitomised by an ambiguity around Wolff’s character; we as the audience want to root for him as the protagonist of the piece, and perhaps out of sympathy for his condition and his desire to belong, but as Addai-Robinson’s character rightly points out, he’s a criminal and a killer, so should we be rooting for him? It sums up the main flaw with The Accountant, in that there are various elements that just don’t seem to quite fit, and it all feels very uneven and very disjointed, leaving a frustrating sense that it didn’t quite know what it wanted to be, and that perhaps O’Connor tried to take on too much. Despite the various subplots eventually all coming together, they did so in a convoluted and long-winded fashion that lacked any refinement or real cohesion. It is still a very entertaining picture and offers something quite different in both positive and negative ways: positive due to the character and the subject of autism so respectfully handled; negative in that it’s so hard to define because it lacked any real identity or signature other than its premise of an anti-hero with autism. But, the action is great, performances solid, and there’s a healthy dose of humour to break up any intensity. It’s just not quite polished enough to stand out as a concise thriller.